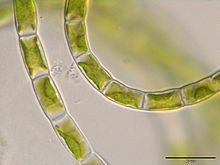 The Charophyceae are the green algae closest to plants. Their exact rank is the matter of some debate. Some botanists recommend expanding the existing plant kingdom to include charophyceans and chlorophytes. Others classify Charophyceae as a class under division Charophyta, with Chlorophyta remaining a distinct division. There are also other possibilities. The consensus among botanists is that charophyceans are the organisms most closely related to land plants (embryophytes). Many of the complex plant traits related to sexual reproduction evolved first in charophyceans.[source?] Analysis of cpDNA (chloroplast DNA) shows that characteristics of plant chloroplasts also evolved first in the charophyceans, before the Zygnematales diverged from the lineage that lead to Coleochaetales, Charales, and the land plants. ↑ 1.0 1.1 1.2 Campbell N.A. & Reece J.B. 2005. Biology. 7th ed, Cummings, San Francisco.